#TBT to the July 1991 issue of F&SF. 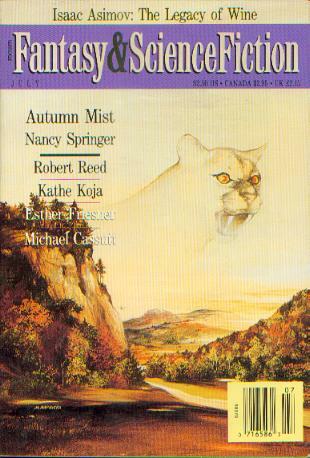 Malgorzata Rapnicka’s cover illustrates “Autumn Mist” by Nancy Springer. The issue also includes stories by Michael Cassutt, Larry Tritten, Tony Daniel, Elizabeth Engstrom, Esther M. Friesner, and Kathe Koja. Rusch would become known for introducing many new writers to readers of F&SF: here, it’s with “Fetch Felix,” the first published story by Sally Caves, who also wrote a couple episodes for Star Trek — “Hollow Pursuits” on The Next Generation and “Babel” for Deep Space Nine. The issue is rounded out with book reviews by Budrys and Card, a science column by Asimov, an F&SF competition, and several cartoons. The perfect mix of old and new, beginning a new era for the magazine. #TBT to the July 1958 F&SF. Barry Waldman’s cover is for Ron Goulart’s story “The Katy Dialogues” about a robot actress and a slimy PR guy stranded in space. 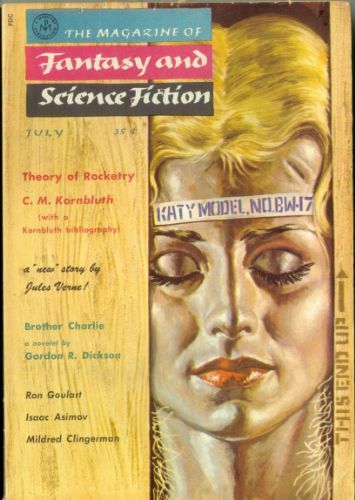 The main story, and the last story in the issue, is “Theory of Rocketry” by C. M. Kornbluth, who died of a heart attack in March 1958 on his way to a job interview at F&SF. Kornbluth had been tapped to replace Anthony Boucher as editor of the magazine. He was only 34 years old. “Theory of Rocketry” was a Hugo finalist in 1959, along with 2 other Kornbluth stories. But this wasn’t his last published work: Kornbluth was so prolific that new stories, many finished by Frederik Pohl, continued to be published from his files until 1988. The full-page introduction to the story functions as a memorial to Kornbluth. A bibliography of his work replaces the usual books column. The bibliographer opines that: “Cyril Kornbluth’s short stories may never be completely identified. In his prolific teens, he was writing under 18 or 19 pseudonyms at once.” Kornbluth’s loss was keenly felt by those at the magazine. The lead story in the issue is the Odyssean-inspired space adventure “Brother Charlie” by Gordon R. Dickson. In the intro to “The Reign of Tarquin the Tall” by Kit Reed, the editor notes that it’s a difficult story to classify. He writes that it’s one of those stories in F&SF which “are not, strictly speaking, either fantasy or science fiction, but simply strange stories, commercially unsuited to virtually any other markets.” He adds: “It would be handy to a have a term for such off-beat stories.” Today Reed’s tale would be probably be called slipstream or weird fiction by critics (and it would still have a place in the magazine). F&SF has a long history of translated stories. This issue includes the first English version of “Gil Braltar” by Jules Verne, trans. by I. O. Evans. The rest of the issue has the usual variety you expect from F&SF. “The Day of the Green Velvet Cloak” by Mildred Clingerman is a curiosity shop story with a twist of time travel. “The Up-to-Date Sorcerer” by Isaac Asimov is, despite the title, a science fiction story that’s full of Gilbert and Sullivan puns. “The Vandals” by Stephen Barr, and two reprints, “The Eighth Lamp” by Roy Vickers and “The Blue-Eyed Horse” by Michael Fessier, along with a science column by William Morrison, round out the issue. Van Gelder lays out his vision for the magazine in his first editorial: “my goal is to bring you the most entertaining magazine possible each month — the best blend of fiction, the most interesting columns, and a surprise or three to keep you on your toes. I sort of envision this magazine’s appearance each month in your mailbox as being like a visit from an old friend bearing gifts.” This first issue lives up to that goal, with a wide variety of stories, columns, and more. Reed’s cover story mixes a painter, a small town, and a dark secret. Robert Reed is followed by Kit Reed and her story “Rajmahal,” a story about an American woman’s affair with a rebel in India. M. Shayne Bell offers “Bright, New Skies,” about an ozone-free earth. It began as a play for teaching English to scientists from Siberia. “The Pipes of Pan” by Brian Stableford blends Greek myth with Neverland. It was picked up by Dozois and Hartwell for their respecitve Year’s Bests. “Jelly Bones” by Robin Aurelian (aka Nina Kiriki Hoffman) begins: “Sometimes bones are just an inconvenience. I melted mine.” Then it gets weird. “The Macklin Gift” by Pat McEwen is a disturbing story about a family with strange powers. It was her first appearance in the magazine. Ron Goulart closes the issue with “Why I Never Went Steady With Heather Moon,” the first of his Heather Moon stories. Reflecting Van Gelder’s interest in books — and his belief that there’s not enough discussion about them — the issue has four book columns. Add in a film column by Kathi Maio, four cartoons, and the announcement of the new science column by Pat Murphy and Paul Doherty, and you can see both the continuity with the past and the distinctive mark of the new editor on the magazine. 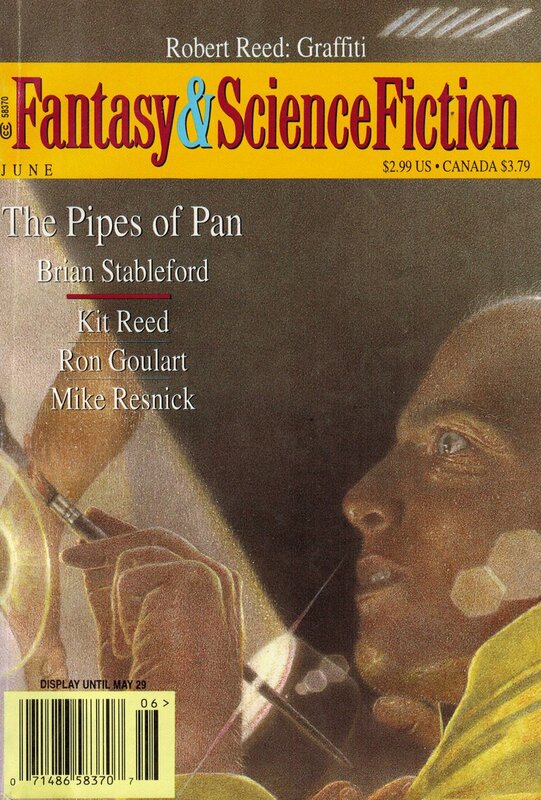 #TBT to the June 1991 issue of F&SF. Stephen Gervais’s cover illustrates “The Blessed/Damned Thornston Emerald” by Grania Davis. Ed Ferman was very good at finding “something special.” Altogether, he edited 306 issues (or 319, if you count those he edited for the year and a month that Joseph Ferman’s name led the masthead), and he won 8 Hugo and 3 World Fantasy awards — among many other recognitions — for his work. The stories and writers he edited and developed won even more. This last issue shows the range and depth of his tastes as editor. 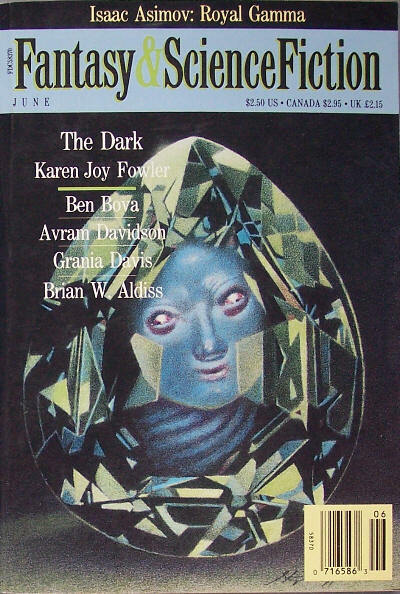 The lead story is “The Dark” by Karen Joy Fowler, a 1992 Nebula finalist. Ferman describes the next story, “Wordworld” by Carolyn Ives Gilman, as “an extraordinary linguistic leap of imagination.” It’s a fun, smart piece of writing, typical of the kind of story you’d find during his editorship. “Deuce” by Henry Slesar belongs to the tiny subgenre of fantasy stories about the sport of tennis. To these stories, he added some “big names.” “Better Morphosis” by Brian W. Aldiss is a lighthearted reprint from the Nasacon II program book and the IAFA Conference of 1990, a rare reprint in F&SF but typical in that it’s the kind of story that appeared someplace where the magazine’s readers might not normally see it. “Vacuum Cleaner” by Ben Bova is another entry is his astronaut-entrepreneur Sam Gunn series, this time focused on orbital junk. “The Day They All Came Back” by Avram Davidson is a clever piece of flash written by the former F&SF editor that Ferman replaced. F&SF has always published new writers and non-US writers, and the last issue of Ferman’s leadership is no different. “Blue Angel” by Norwegian author Wennicke Eide is her first — and ended up being her only — story in F&SF. Ferman described the writing as “powerful and disturbing… the work of a major talent.” She also published one story each in Amazing, Asimov’s, and a Tor anthology. We did a quick search to find out what happened to her and her writing after that, but couldn’t find anything. So it goes. The issue closes with “The Blessed/Damned Thorston Emerald” by Grania Davis, a story involving an inheritance and some adventures. Ferman celebrated his 80th birthday in March of this year. He still reads F&SF — he let us know that he liked the recent Plumage from Pegasus column by Paul Di Filippo. 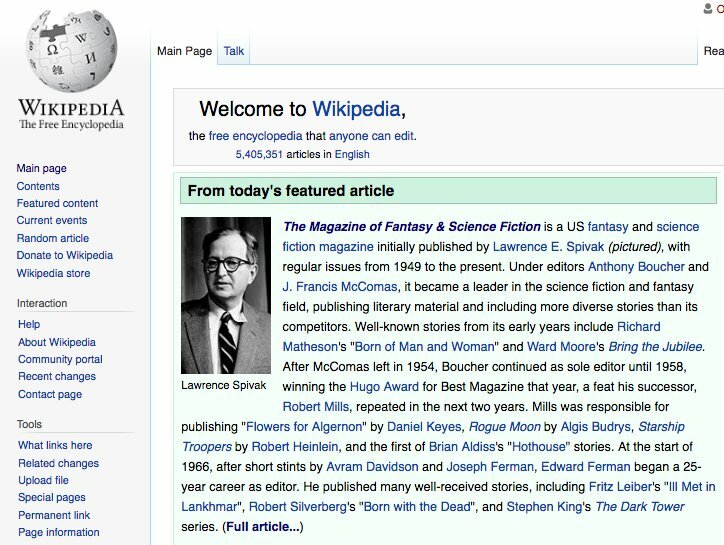 So today’s #TBT is a tribute to Edward L. Ferman, his long tenure at Fantasy & Science Fiction, and all his contributions to the genre. Thanks, Ed.